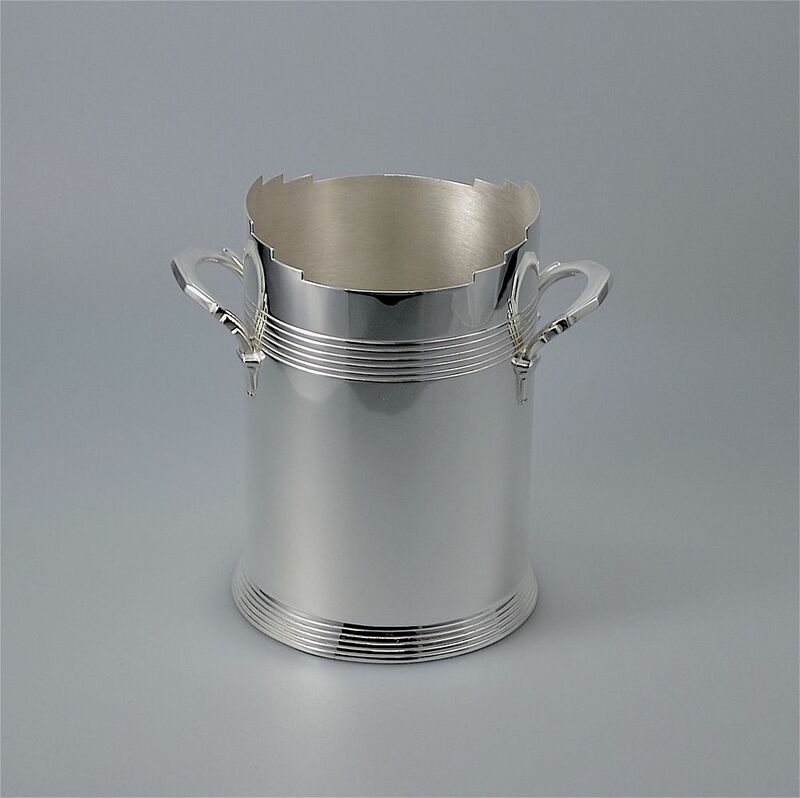 This fabulous silver plated wine cooler was designed by Keith Murray for Mappin & Webb. The flared foot has 5 incised rings and the cylindrical body of the cooler has 6 incised rings just above the base of the handles. The top is crenelated. The base is signed "Triple Deposit Mappin & Webb Prince's Plate London & Sheffield" in the centre of which is a triskelion like symbol. There is a shield shaped cartouche containing the letter "J" which is probably the date mark. Below the cartouche is "W27840" and below that is "O 9 1 RGD 772183" Elegant stylish & useful like all Keith Murray for Mappin & Webb items. Keith Murray was born in New Zealand but came to England when he was 14. He qualified as an architect but turned his hand to illustrating before becoming a full time designer. He worked on a freelance basis for the glass makers Steven & Williams and then for Wedgwood pottery and his designs in metal were created for Mappin & Webb. In 1936 he was appointed architect in charge of designing Wedgwood's new factory in Burlaston and he returned to architecture after the war.